One of my favorite times of the wedding day to photograph is the getting ready portion. This is the time where if you are lucky, you will get to really know your bride and see her interacting with her family and bridesmaids. Alex gave her sister a pearl bracelet that matched her own that she wore which was made from their grandma's old pearl necklace. The moment was so sweet and beautiful and it was all we could do to not cry as it was happening. In this image, Alex is getting into her beautiful lace wedding gown from Coastal Knot, while her sister and soon to be sister in law help button up the back. 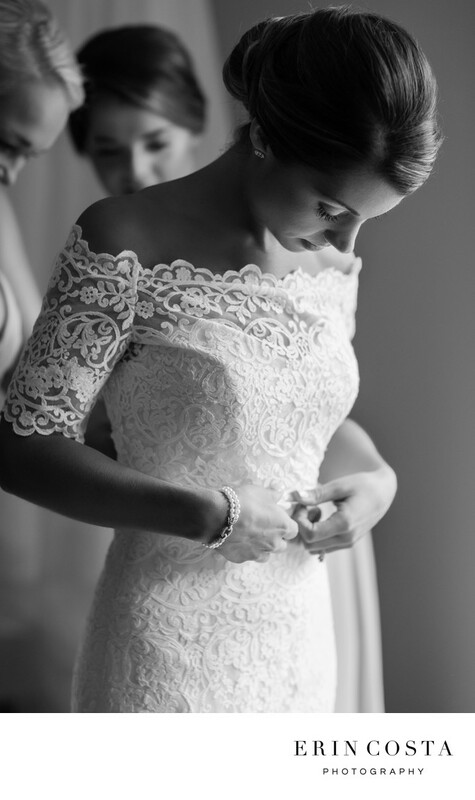 Alex chose several difference pieces mixed and matched for her wedding gown, but the result was flawless. On her wrist you can see the beautiful pearl bracelet that is her something old. The light that comes in the back patio doors at The Barn at Rock Creek is absolutely divine. I just stepped Alex back away from the doors just a bit, and then let the moment unfold in the beautiful kiss of light. The light in the bridal suite at the Barn at Rock Creek is just one of the many reasons I love to photograph there.